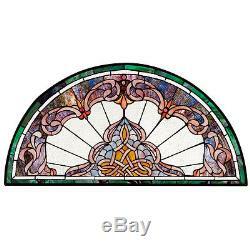 32.5 Half Moon Demi Lune Hand Crafted Victorian Style Stained Glass Window. More than 230 individually hand-cut pieces of authentic art glass encased in glaziers lead. The elegance of a traditional half-moon shape blends with the sparkling beauty of vibrantly colored glass to create a Victorian-inspired window that tints the sunlight with scintillating shades of amethyst, light blue and gold. Each piece of art glass in this almost-yard-long work is hand-cut, copper-foiled and individually soldered, requiring three full days to complete. Scroll bracket and chain included for hanging. Feel free to ask any questions. Looking for more unique gift ideas? Celtic, Gothic, Greek, Roman, Art Deco, & More! The item "32.5 Half Moon Demi Lune Hand Crafted Victorian Style Stained Glass Window" is in sale since Tuesday, January 17, 2017. This item is in the category "Pottery & Glass\Glass\Art Glass\Stained Glass". The seller is "stephaney74" and is located in Palm Coast, Florida. This item can be shipped to United States, Canada, United Kingdom, China, Mexico, Germany, Japan, Brazil, France, Australia, Russian federation, Denmark, Romania, Slovakia, Bulgaria, Czech republic, Finland, Hungary, Latvia, Lithuania, Malta, Estonia, Greece, Portugal, Cyprus, Slovenia, Sweden, South Korea, Indonesia, Taiwan, South africa, Thailand, Belgium, Hong Kong, Ireland, Netherlands, Poland, Spain, Italy, Austria, Israel, New Zealand, Philippines, Singapore, Switzerland, Norway, Saudi arabia, Ukraine, United arab emirates, Qatar, Kuwait, Bahrain, Croatia, Malaysia, Chile, Colombia, Costa rica, Panama, Trinidad and tobago, Guatemala, Honduras, Jamaica, Antigua and barbuda, Aruba, Belize, Dominica, Grenada, Saint kitts and nevis, Saint lucia, Montserrat, Turks and caicos islands, Barbados, Bangladesh, Bermuda, Brunei darussalam, Bolivia, Ecuador, Egypt, French guiana, Guernsey, Gibraltar, Guadeloupe, Iceland, Jersey, Jordan, Cambodia, Cayman islands, Liechtenstein, Sri lanka, Luxembourg, Monaco, Macao, Martinique, Maldives, Nicaragua, Oman, Peru, Pakistan, Paraguay, Reunion.